Location was great, unfortunately it rained the whole time so the proximity to the view was wasted. When we arrived at the property we were informed that we were upgraded to a forest view unit which was beautiful. The fireplace was already lit when we entered the room which was very appreciated at it was 5 degrees outside. The spa bath was very relaxing. Lovely and helpful staff. Staff were very friendly and told us a lot about what to do in the local area. Amazing location backing onto the national park. Saw black cockatoos whilst we were sitting on the balcony. I liked how they spaced people out in other areas so it stayed nice and quiet. The location was stunning and so close to the natural wonders, including great walking tracks Wentworth Falls has to offer. The fireplace was on when we checked into our room which was very welcoming on a cold day. The host was very helpful and provided us with good recommendations for not to miss places to see and do in the mountains. Overall, fantastic stay how ever next time we will stay longer in the Blue Mountains!! Location was very handy although a different name to the property than advertised on Booking.com so a little confusing to find at first. Fire place was an added bonus as it turned very cold overnight. Great location for bushwalking and quick drive to Leura. Lovely spa bath. location , host friendly, very accommodating to changes. The property & setting were beautiful, easy to find & close to shops if needed & close to attractions. The decor was nice & loft apartment lovely high ceilings. Beautiful bathroom, enjoyed the spa bath. 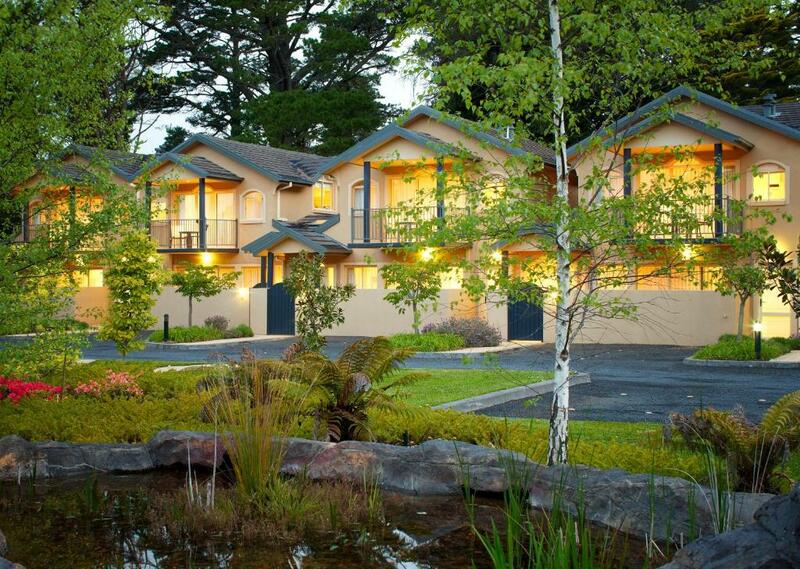 Lock in a great price for Falls Mountain Retreat Blue Mountains – rated 9.1 by recent guests! Falls Mountain Retreat Blue Mountains This rating is a reflection of how the property compares to the industry standard when it comes to price, facilities and services available. It's based on a self-evaluation by the property. Use this rating to help choose your stay! Falls Mountain Retreat offers modern and luxurious self-catered and self-contained studios and apartments in the heart of the Blue Mountains. All accommodations has a large courtyard or spacious balcony. Hidden away among 4 acres of peaceful gardens, it is just 650 feet from walking trails, waterfalls and breathtaking views. Leura is a 5-minute drive away and it is 10 minutes’ drive to Katoomba. All rooms at Falls Mountain Retreat Blue Mountains include an open fireplace, air conditioning, DVD/MP3/CD player and kitchen facilities. Each room has a 2-person hydrotherapy massage hot tub. Activities nearby include horse riding, fishing, mountain bike riding, abseiling and rock climbing. Echo Point, The Three Sisters and Scenic World are all 10 minutes’ from The Falls Mountain Retreat. When would you like to stay at Falls Mountain Retreat Blue Mountains? In a top floor position with plenty of natural light, this self-catered apartment includes high ceilings, glass sliding doors onto a private balcony, and a basic kitchenette. This room cannot accommodate any extra beds or cots. Please note that apartments will not be serviced daily. This self-catered studio is located on the top floor with forest and garden views from the private balcony. This self-catered apartment features a separate lounge/dining room, kitchen, laundry and a private courtyard. This self-catered, spacious 2-story apartment, features a courtyard and private balcony with outdoor entertaining area. This self-catered apartment features a fully-equipped kitchen and a patio. This room cannot accommodate any extra beds or cots.There is no capacity for additional guests. House Rules Falls Mountain Retreat Blue Mountains takes special requests – add in the next step! Falls Mountain Retreat Blue Mountains accepts these cards and reserves the right to temporarily hold an amount prior to arrival. Please note that a 1.5% surcharge applies for all payments by credit card. Please note that for arrivals after 18:30 an additional AUD 90 charge will apply if you have not arranged pre-registration with the property at least 24 hours prior. Please inform Falls Mountain Retreat Blue Mountains of your expected arrival time in advance. You can use the Special Requests box when booking, or contact the property directly using the contact details in your confirmation. Room was large and generously proportioned. A better option for beverages would have been nice - so easy to have plunger coffee, not instant! Doesn't fit with the price range of the property which was quite high considering no food options were available. No breakfast. The fact i had to wash up and dry my dishes. Room was amazing. View was lovely. Peacefully relaxing stay.